Our Christingle service is a family friendly service which lasts around 30 minutes and where each child will receive a Christingle. 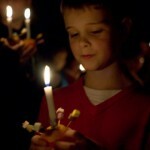 A Christingle is made up of four parts. The orange represents the world, the candle represents Jesus as the Light of the world, the red ribbon represents Jesus’ death on the cross and the sweets represent the 4 seasons and the fruits of the earth. We have 3 Christingle services on Christmas Eve this year at 4pm, 5.30pm and then 7pm. If you or your child require additional support then please let us know when making your reservation, or give us a call, so that we know how best to support you. Unfortunately we are unable to accept any more Christingle reservations for the 4pm and 5.30pm services although it is possible to sign up for a reserve list in case spaces become available. We’re sorry for the inconvenience this might cause.